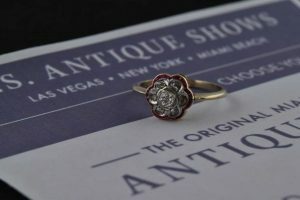 I stumbled across this ring last week – and I haven’t stopped thinking about it since! First, I showed it to my work friends, only to discover that they love it as much as I do. Then, I added to the diamond case, thinking that some lucky girl should have it for her engagement ring. Finally, yesterday I spirited it away to take some photos so I could share it with you. It’s really occupying too much of my time BUT just look at it! 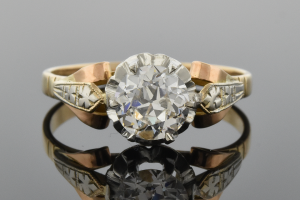 Don’t you just love this tiny bridge of diamonds on each side? I sure do! The additional 26 diamonds add another .14 carats of bling, bringing the total diamond weight to .66 carats… but it looks like so much more! 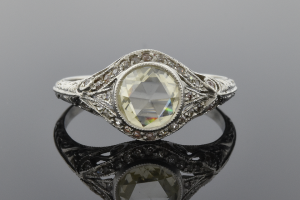 This ring is available in our showroom now (as soon as I put it back) for just $1900. It’s ALOT of look for that price. You have to see it to believe it! When David (my husband) and I first started talking about engagement rings, my original thought was random and a bit irrational. Even then (18 plus years ago), I worked at Joden – a fact that influenced my engagement ring journey in more ways than one. Working here, we handle quite large diamonds on a daily basis. I had become very spoiled. My first thought went something like this – “Let’s buy the biggest diamond we can afford! I want a really big diamond!” As you can imagine this thought was not very popular with David… not only for financial reasons, but also because he wanted me to have a ring with character. A forever ring. 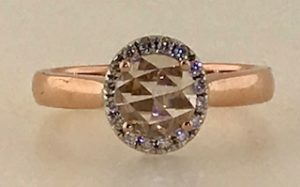 This is the thought that led me to set aside a radiant diamond that weighed 1.26 carats but actually looked much larger, closer to 2.00 carats. David hated it immediately. And to be blunt, I didn’t love it either. But it LOOKED big! 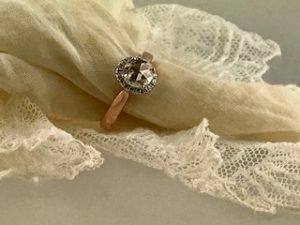 I stuck with it for several weeks – until I laid eyes on my ring. One day I walked into Joe’s office, and there it was just laying on a black velvet tray. As soon as I put it on my finger, I knew it was the ring. The decision had little to do with the size of the diamond and everything to do with the way I felt when I looked at the ring. 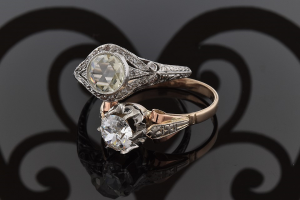 The first ring is an authentic Edwardian ring from 1915 with a rose-cut diamond center stone. That alone makes the ring unique. Add in the fine filigree detailing on the sides of the ring, the exquisite engraving that extends down the shoulders, and the tiny milgrain beads that create a knife edge at the peak of the band – it’s a rare beauty. 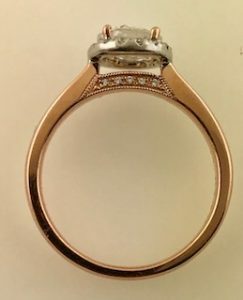 The photos do not do justice to this piece, you NEED to see this ring in person! But you better hurry… priced at just $6500, it won’t last long. This ring, from the early 1940’s is all about the multicolor gold. Rose gold scrolls support the kite shaped white gold segments that flank the center diamond – each one hand engraved with a floral-esque pattern. 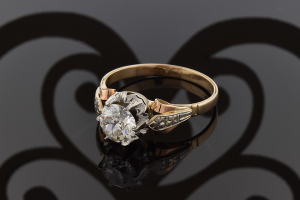 The yellow gold shank makes this ring a perfect trifecta of golden loveliness. If you’re a Retro girl, this ring is for you. It’s available on our site for only $4700.00. 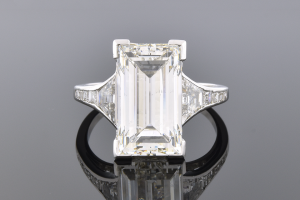 A vision of Art Deco perfection, this 6.58 carat diamond is absolutely stunning. I cannot do justice to this ring with mere words. Let me just add this… with an appraised value of $196,245.00, what could possibly be better? Come in and experience the luxury for yourself. Go to our site and look, then come to Joden and touch.